With squalls of 30 knots on the course only one race took place today. Andy Couch still has the lead with another bullet today. The full results will be posted later tonight as they are still being worked on. 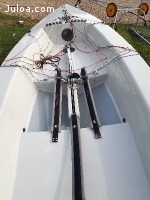 Mike Webster's "One Week In July" video epic of the Abersoch dinghy week has been added to the videos page. The only thing you can say is Brilliant! Oh and how fast were you driving to get there??? 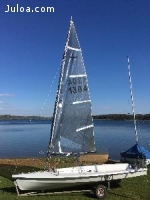 I have had a few requests for boat charters, one being Steve Bolland who is a past RS300 National Champ, he is very interested in the Phantom and I think once we get him in one, he will stay!! it been Haunting him forever!! If you are interested I can put you in contact directly with the interested parties so you can negotiate the "Beer Token" compensation for loaning you boat.